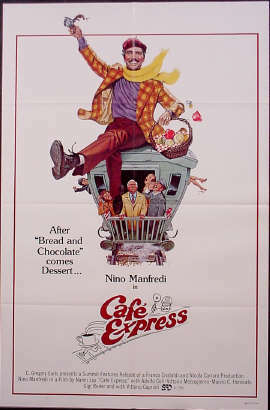 When he was running up and down Italy shooting a television program about passengers on second-class trains, the director Nanni Loy ran into a strange character, a man out of work who had "invented" a profession by boarding trains at night to sell people coffee, without a license and without paying taxes. This gave rise to CAFFE EXPRESS (COFFEE EXPRESS: 1979), one of Loy's best films and one of Manfredi's most searching and complete performances. The actor builds the character with the greatest care, starting with the slightly ridiculous external features, stressing his unintentional parody of the real coffee-vendors hired to serve Pullman cars, but also giving glimpses, between one gesture and the other, of the secret suffering of a poor devil constantly exposed to the risk of being arrested. Loy, who like all his generation of directors was formed in the neo-realistic school, returns with warmth and conviction to that "shadowing" of the common people in their everyday behavior dear to Zavattini and exploits the multifarious world of a second-class carriage for a whole series of even fleeting human portraits. There was probably no need to add an element of suspense (the gang of robbers pursuing the coffee-vendor who has refused to become their accomplice and the policemen on his trail to take him to jail), nor that superfluous pathetic touch given by the presence on the train of his son, who has run away from boarding-school to come home to his father. In any case, the film is intense, deeply felt and amusing, one of the finest achievements of Italian-style comedy.